Alaturbi is a festival involving the Black Sea. It is celebrated along the Balkan/Black Sea area on different dates that vary from the 20th of May to the 6th of July. The festival has a double purpose. Primarily, it celebrates and honors the sea, but it is also a pilgrimage (comparable to that of Lourdes) for people who suffer from pain, aches and epilepsy. According to folklore and legend, their travels and celebrations in search of healing will bring them relief. Those who can swim jump into the sea; while those who cannot take a bath in seawater. Still others believe in the healing and spiritual benefits of a boat trip along the river mouth. Horon is a communal dance form with many variations that are widespread throughout the Balkans. 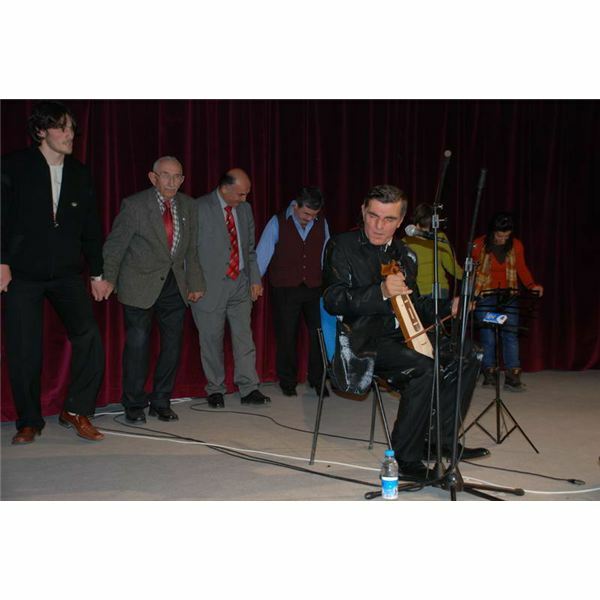 The Turkish version is from around the region of Trabzon on the Black Sea, and is performed by young men, only. No female dancers participate. The traditional costume consists of black boots, black trousers and a black waistcoat, all richly embroidered with silver thread and adorned with silver belts and coins. A white, long-sleeved silk shirt is worn underneath. The dance is usually performed at celebrations, such as weddings. The young men — often professional Horon dancers — line up, clasp hands and touch shoulders, and literally quiver to the sound of a traditional instrument called a kemece, which resembles a violin with only three strings. They jump, kneel, rattle and stomp but do not move far from their original position. This line dance requires a high level of skill, agility and speed as the movements increase toward a frantic crescendo and abrupt finale. Marriage – To predict if a marriage will be successful, a bride, upon entering her new home, is asked to break a vine into three equal pieces. The pieces are planted outside the house. If they all sprout, the marriage will be a happy and fruitful one. Children and Disabilities – Small children, who have trouble walking or learning to walk, are believed to be hindered in their efforts by an invisible tie between their feet. To solve this problem, a shoelace is wound around their ankles. Then, the oldest child of the family, or the first person to leave the mosque after Friday prayer, cuts the visible shoelace around the child's ankles, thus breaking the bad luck and the invisible shoelace. Pregnancy and the Blackberry Tree – According to Black Sea folklore, one very simple remedy exists for the following three afflictions: a woman who has difficulties with pregnancy and fertility, a cow in the same situation and, strangely, children who wet their beds. The woman, the cow and the children must walk under a blackberry tree, and all will be well. Sickness and Death – A last resort for the desperately ill is to look at the moon on a shovel. This custom has its origin in the pagan worship of the moon as a god who either cures or takes a life. It is unknown, however, why a wooden shovel is used. In addition, after a death, it is wise to keep the light on all night. Nazar Beads – This glass bead in the teardrop shape of an eye is a common sight in modern Turkey. A good luck charm, the bead's stare is said to frighten away the evil eye. Mirrors – A superstition common to several cultures, perhaps its origins lie in Turkey — breaking a mirror will bring seven years' bad luck. A less common belief is that mirrors can capture souls, and when not using your mirror you should turn it to the wall — just to be on the safe side. Other Superstitions – Don't give a friend a knife — it will cut your friendship. Also, don't tell your dreams before breakfast if you want them to come true (tell your nightmares instead!). To ward off bad fate and bad luck, you can knock on wood twice, making two kissing noises, or tugging each earlobe. Kolot is the name of a bread bun prepared with salt, flour and oil. To work its magic, the ingredients must come from seven different houses, the water to make the dough has to be brought from seven different rivers, and seven different pieces of wood, cut from seven different hedges, need to be burned in the fire to cook the salty bun. This is no easy feat, however. Once baked, legend has it, young girls who eat the finished product will see their future husband in their dreams that night. It's unknown in the Black Sea region and the folklore of Turkey what happens if they eat more than one bun! Khosrowshahi, Dr. Manoucher. "Folklore." http://socialscience.tjc.edu/mkho/fulbright/1998/turkey/casey.htm Accessed 13 Aug 2011. Image: Blue Eyes by FocalPoint under Creative Commons, from Wikipedia Commons. Image: Horon by Macukali under Public Domain on Wikimedia Commons.